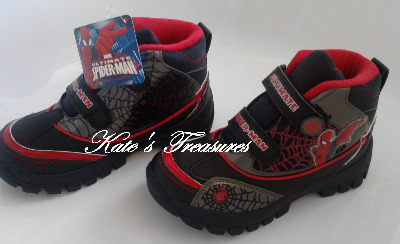 Here are the most Amazing Spiderman Boots. Every boy would love to wear these fantastic shoes! Perfect for Autumn and Winter as they will keep their feet warm and cosy. Hard grip non slip soles. Double velcro fastening for easy wear. Padded lining and sock for extra comfort. Picture of Spiderman on the side panel.